If you’re a military homeowner who’s received PCS orders to move during the ‘off-season,’ i.e., not during the traditional summer military moving season, you may be wondering what to do next or if attempting to sell your home is even realistic. As you weigh the pros and cons of holiday home selling and decide it’s worth a shot, there are a few things you’ll want to keep in mind when it comes to selling your home during the winter months. 1) Think positive! Remind yourself that you’ll have less competition. Fewer homes on the market equal less competition for you. As well, home buyers will have a stronger sense of urgency and a true need for getting into a home if they’re looking at this time of year. People don’t tend to window shop for homes or stroll through open houses with no serious intentions like they might in the warmer months. Realize this is not the time to go high with your price to test the waters of the market. Research and use your listing agent’s knowledge to gauge your local home selling market. Compare similar homes that have sold in the past month. Fewer shoppers mean less potential for a bidding war among several home buyers, so you’ll need to plan accordingly. 3) Get your home cold weather ready. Home buyers will notice cold, drafty homes. Get your home’s HVAC system serviced, change out air filters, and spend time replacing weather stripping around windows and doors. If you have a fireplace, arrange for a chimney cleaning. Pay attention to the outside, too. Clear gutters, remove icicles, and get rid of dead leaves to maximize curb appeal. 4) Make a plan for containing the clutter. Keeping your home show-ready during the holiday season may seem like an impossible task. Many of us fill our closets with presents or regular home decor that we’ve tucked away while our Christmas goodies are out. Either find a dedicated, organized spot in your home for those extra items or pay for a small storage space. 5) Think cozy and simple when it comes to holiday decor. While you’ll want to make the space as neutral as possible per the usual home showing advice and remove personal photos or memorabilia, you don’t have to completely forego holiday decorating. Consider these tips for hosting your winter open house. Keep Christmas decor simple. People won’t be surprised to see a string of garland or Christmas tree at this time of year, but you may want to skip the extensive Griswold light show on your lawn. Choose holiday decor in similar or complementary styles to create continuity from the door wreath to the mantel display. Go for a cozy vibe: soft throw on the back of a couch, stack of firewood, pumpkin spice candles. During these darker months, either remove heavy curtains, opt for sheers, or open them wide to allow in lots of natural light. 6) Be sure to get non-seasonal photos of your home for your listing. You’ll want to showcase your home’s best features without any distractions, so take photos for your online listing before hauling out the holiday baubles. 7) Create an amazing virtual tour to offset the potential effects of bad weather and limited showings. Pictures are great, but a serious buyer will want to walk through your home. If they can’t reach you due to a snow day, a virtual tour is the next best thing! Either design your own or hire a professional to create the feeling that home shoppers have really experienced what your home offers. The tips in our post 7 Must-Have’s for Your Home’s Virtual Tour are a great starting point. 8) Pass off hostess duties to someone else. As if a winter PCS isn’t stressful enough, it will be difficult to have your home ready to show at a moment’s notice if your cousins are staying with you or you’re prepping for your traditional holiday gala. Let some things go this year. 9) Make the most of every possible selling avenue. From street signs to leveraging the power of social media, this is not the time to hold back. Ask your friends to share your listing on Facebook and get the best home ad possible. Whatever you do, make it easy for home buyers to find you! 10) Realize that closing may take longer than usual. If you’ve made it through showing your home and received an offer, you’ll still need to practice some patience. Everyone from the loan underwriter to the appraiser may be either taking time off or on semi-vacation, so plan for the fact that closing on your home may take a bit longer. Are you hoping to sell your home this winter? 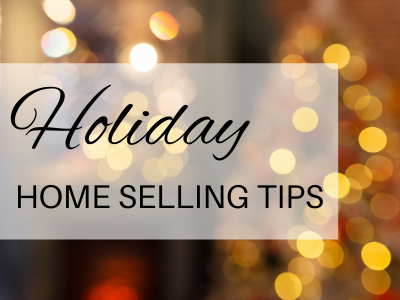 Download this easy cheat sheet of holiday home selling tips created just for you from MilitaryByOwner!